$100 Baby Carrier Gift Certificat Giveaway WINNER! That was a fun giveaway, wasn't it? 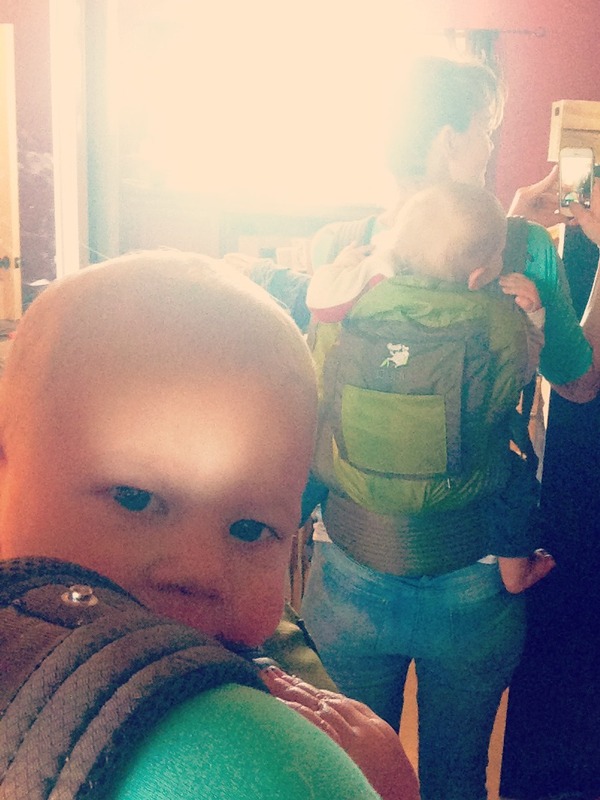 I loved reading all your baby carrier wishes. With Mother's Day quickly approaching, why not suggest a Frog Mama gift certificate to your gift-givers? What a happy gift that would be, and 100% of the proceeds would go towards an adoption! Congratulations to our winner! Take a look below to see if it's you! Support An Adoption! A Baby Carrier Review & GIVEAWAY! After carrying our babies for eleven consecutive years, I suppose I fall into the "baby wearing" category. I honestly couldn't imagine mothering any other way. Babies are calmer, more peaceful, and in a mind-developing state of "quiet alertness" when close to a loving care-giver. A recent article in TODAY was published about the importance of holding your baby. As I write this, I am currently carrying a clingy, teething baby on my back, bouncing him up and down. I would literally get nothing done without a baby carrier. I am so very pleased to partner with Lorene from Frog Mama. Her beautiful family is saving up for an adoption. 100% of the proceeds made from Frog Mama goes to funding their adoption! This is a perfect opportunity to bless a mama with an amazing carrier for Mother's Day and help bring a child into a loving family. To read more about their journey to adoption, visit her blog. If you aren't in need of a baby carrier but would like to help support their adoption, they are also selling rice neck warmers/cold packs infused with soothing herbs to raise money for their adoption. If you would simply like to give, a PayPal option can be found to the right on her blog. What I liked most: This was the coziest carrier I tried. I could feel Joseph and myself immediately relax and snuggle when we wrapped it on. Also? It's gorgeous. 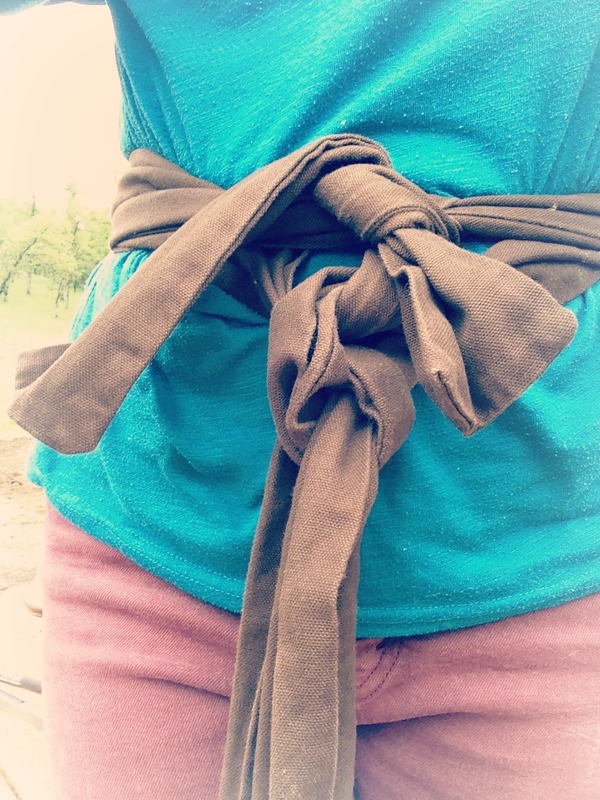 Ease of wear: Once I learned to properly wrap, it goes on like clockwork. You can adjust it to fit perfectly for you and your baby's body shape and size. It can be warn from infancy to toddlerhood. Versatility: There is no end to the ways you can carry your baby with it: side, back, front, rucksack, hip-cross, kangaroo... It's a fun one to play around with. I wore this one while putting together the garden. I loved the flexibility it lent me and how secure it felt. Tying it on is quite simple and very quick. What I liked most: The freedom of movement and how light it is. Ease of wear: Very Easy! 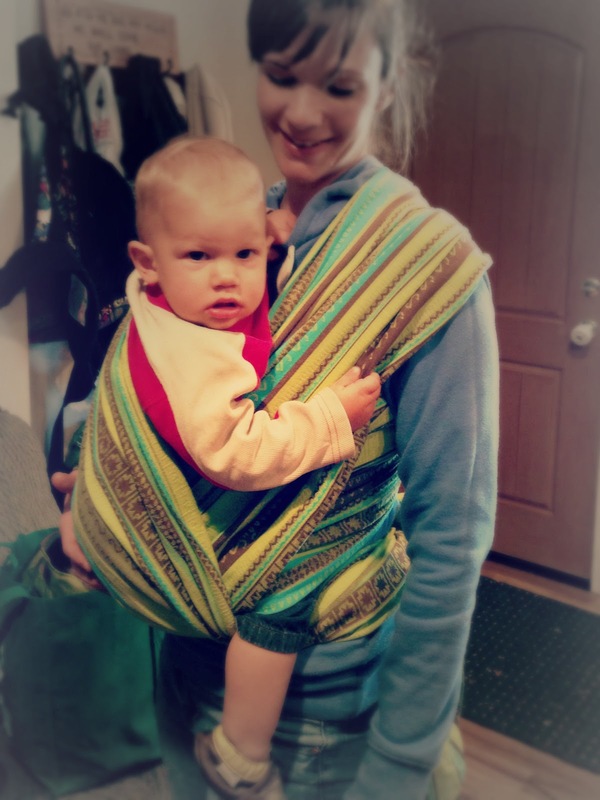 It is a wonderful hybrid of an Ergo-like carrier and a wrap/tie carrier. Versatility: Can be worn on the front and back. What can't this carrier do?! First of all, it carries high which I really like. My baby's head is closer to mine and that is quite cozy and happy. The carrier goes up high and supports baby's back really well, so when they decide to arch, they don't throw you off balance. Are you out and about and grabbing a bite to eat at a restaurant or are at a friend's house and you need a place or baby to eat or just sit? This carrier doubles as a high chair! What I liked most: The shoulder straps and belt is very padded and comfortable. 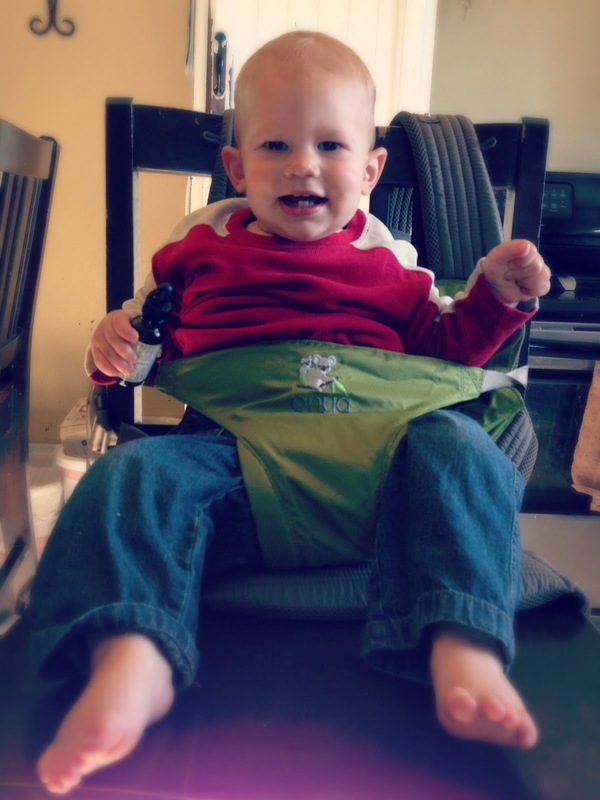 It's easy to put on and adjust, and I love the high chair feature! Ease of wear: Easiest for me who is used to wearing an Ergo Baby Carrier. Versatility: Can be worn in the front or back from six months old into toddlerhood. I wore this one to our local nursery and into the garden for the day. 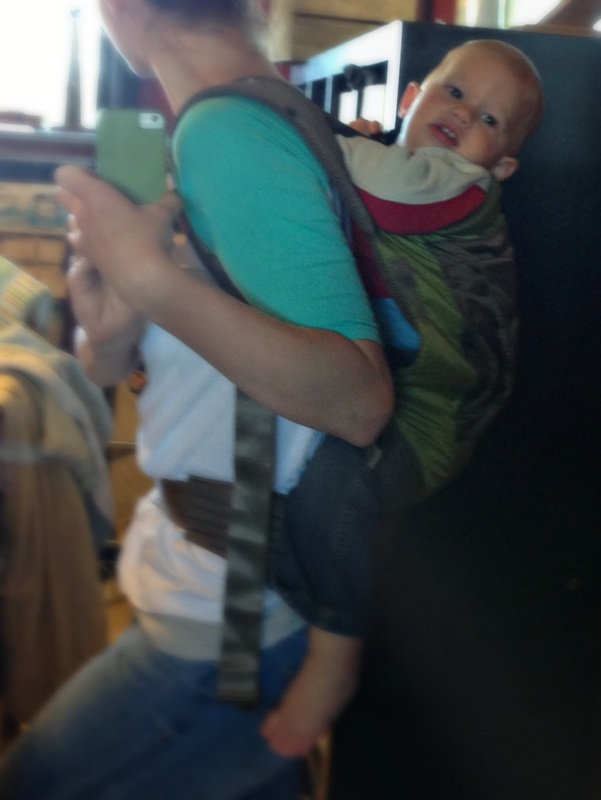 This is a very comfortable, new carrier specifically for toddlers! What I liked most: Comfort and ease to put on, and how well it fit my toddler. Ease of wear: Very high! Versatility: Carries babies 18-48 pounds, adjustable and removable chest strap, ability to shorten the height of the panel, and can be worn in the front or back. Please consider blessing this family as they save up for their adoption! 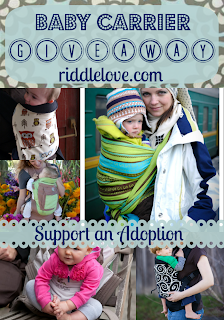 And please enter to win a $100 gift certificate towards a carrier of choice below! Each week I keep thinking,"This week I'll definitely have time to write all -- or at least some -- of the posts that have been churning inside of me." 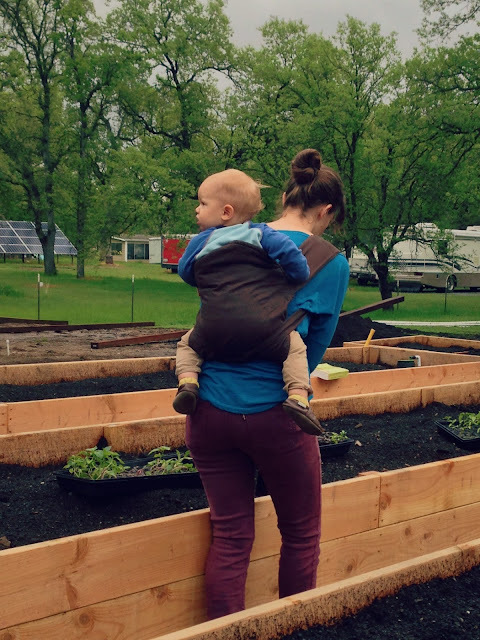 Then a new lamb is born, planting takes longer than planned, and there's always making sure the irrigation is running properly, garden chores, and packing the house up for the expansion in three weeks. No promises for this week, except I can commit to posting a very exciting giveaway and a chance to support an adoption. Let's get this week's food figured out first, m'kay? 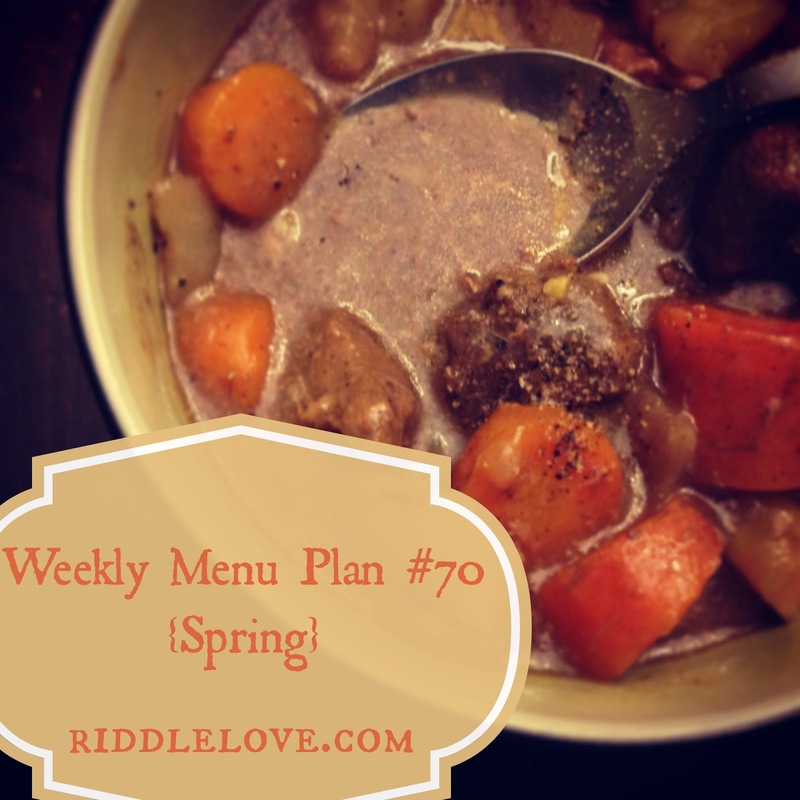 If you have been following our menu plans recently, you have probably noticed one week only slightly differs from the next. 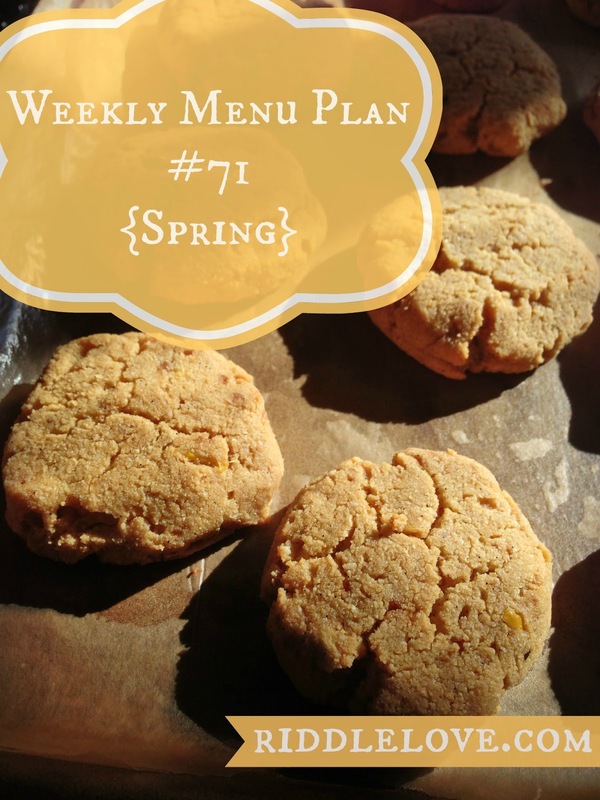 Here is why: when I find meals that my family (or the majority of them) likes, and it's quick to make, I bring it back the following week. And the next. And the next until we tire of it. The children have even come to know which day of the week it is depending on the breakfast. It must be Thursday because we are drinking yummy chocolate breakfast shakes this morning. This has actually brought a sense of stability that routine so often imparts. With so much change and business whirling around, knowing you will wake up to a breakfast you enjoy every specific morning of the week brings comfort. It just does. 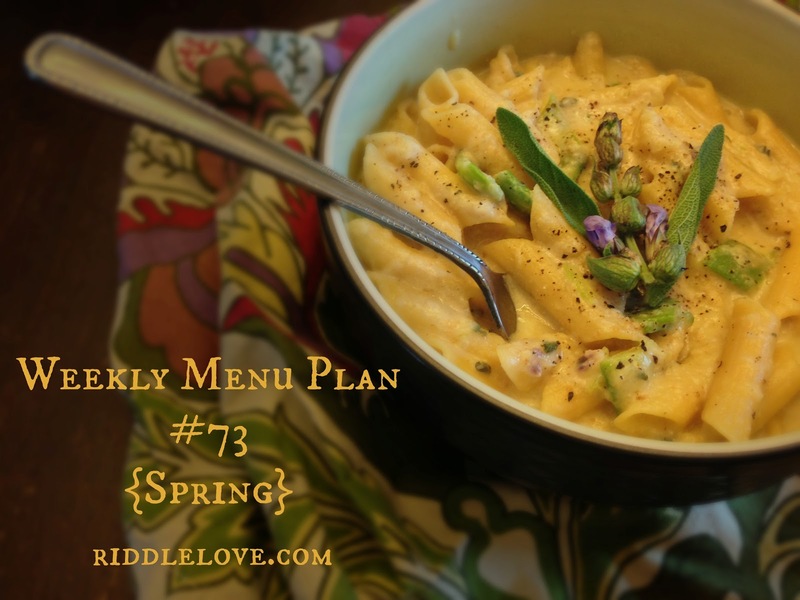 Enjoy the garden's first offerings of spring/early summer with this salad. The cleansing, cancer-fighting, folic acid-rich beets and the iron-packed yet soothing-to-the-stomach fennel make a wonderful partnership in power-boosting your health. The flavors also pair wonderfully together. This recipe can be made without a food processor, but it will take longer. Peel beets & shallots. Use the mincing blade on the food processor to dice shallot. Remove mincing blade and replace with grating attachment. 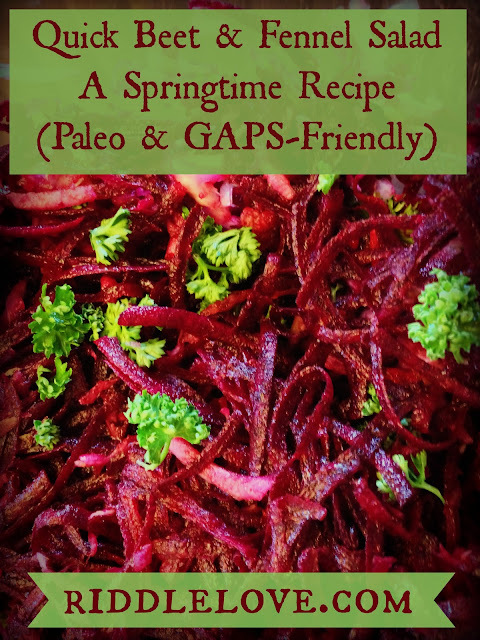 Grate beets and fennel. Scoop processed shallots beets, and fennel into a serving bowl. Add remaining ingredients and stir well to incorporate. Serve and enjoy! Good morning! Happy April! We are on Easter break this week and today is our LFD (Last Frost Date). All you gardeners out there know what that means: there will be a whole lotta plantin' goin' on! Perfect timing, if you ask me. 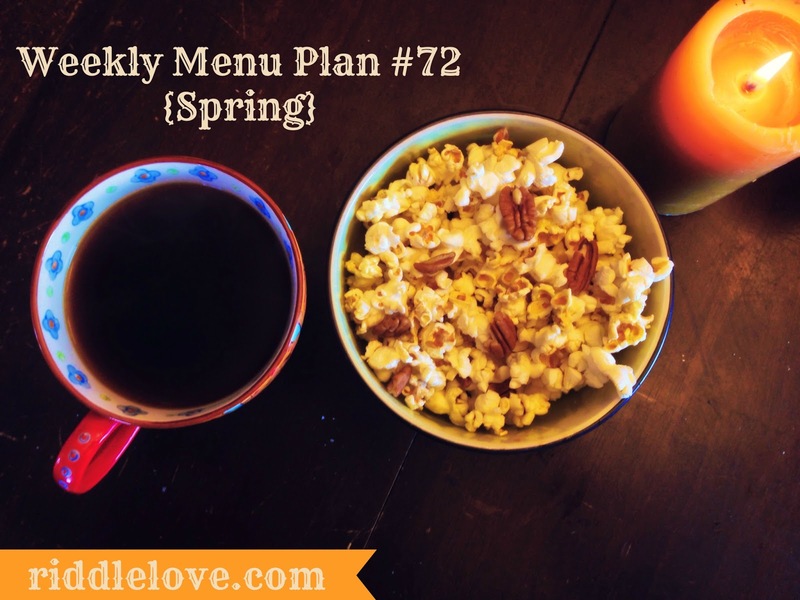 We are keeping things quite simple on the menu plan to make room for all the gardening. There's no denying it. 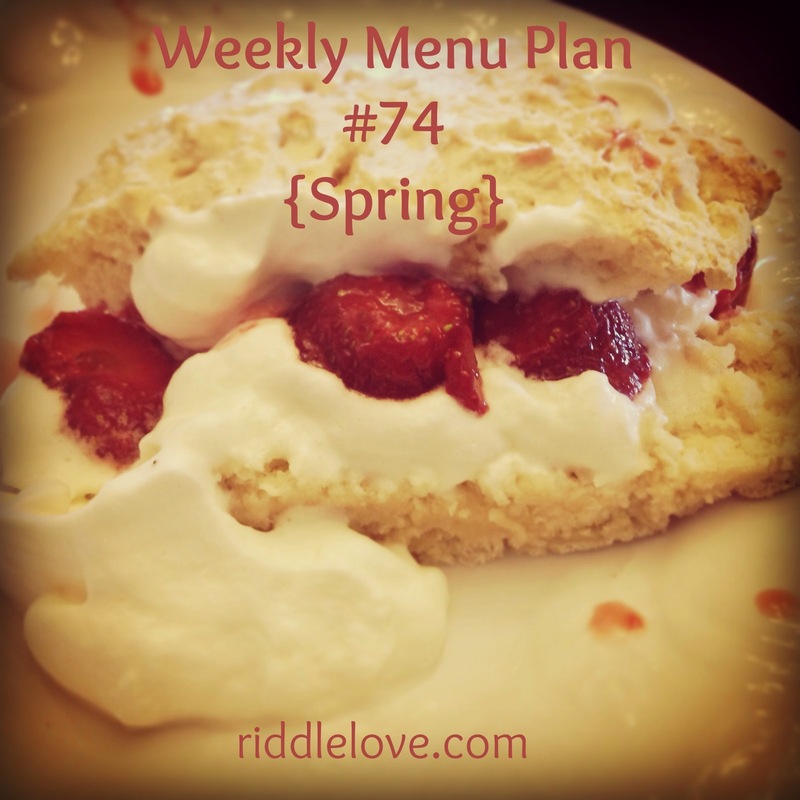 I'm quite giddy about this week!